Now anyone who knows me knows that there are few things that I like more than a Disney Cruise. So it’s probably no surprise that we were on the Fantasy over the Thanksgiving holiday. Now this wasn’t the perfect sailing by any stretch of the imagination. But the very fact that we had a great time – overall – as a family is a true testament to how great Disney does cruising. This time our family was faced with a nine year old whose asthma acted up worse than it had in years, leading to a miserable cough and five visits to the medical facility onboard. Personally, I started to get the feeling that something was hitting me a couple of days into the cruise and wound up feeling awful on the last day at Castaway Cay and continuing now that I am home. The weather was not great. Grand Cayman day was perfect. After that not so much. Cozumel was windy and cool, the last day at sea downright cold and Castaway was a sunny, cool fall-like day too cold to spend time in the water. But given all that, it was an awesome vacation. ‘What?’ you say. Disney Cruise Line does things so well that there were enough highlights of the trip that they far outweighed the negatives. Let’s start with the serving team. We had great servers – Anson from India and Budi from Indonesia. Attentive, happy and friendly. After a less-than-stellar dining experience on our August sailing, we had said we probably wouldn’t go to the dining room every night. This serving team changed our minds. 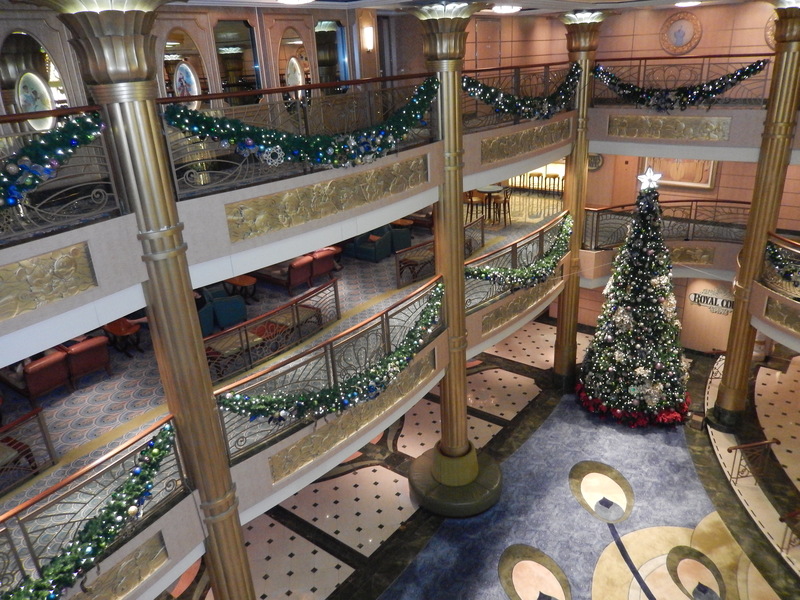 In fact we felt as if we had much better seating in each of the dining rooms this cruise. As members of the highest loyalty level offered by Disney Cruise Line, we wondered why our seating was always so bad the past few sailings. It seems like a bell went off and we were rewarded with much better seating this time! The ship – as always – was amazing. Immaculately clean. Incredibly decorated for the holidays and just a joy to spend a week as a guest. The shows were great and the adult spaces were wonderful. I had perhaps the best massage of my life on this sailing. We attended a lot of the family shows and despite her not feeling great, the little one sang at Karaoke one night and we participated in a family game show (we won!!!). My only complaint was the fake smoke that Disney uses for “effect” during these game shows didn’t do our girl’s asthma any favors. Perhaps with so many kids on the ship, it might be a good idea to eliminate that in the family nightclub for this very reason. We didn’t use the pools so much because the weather was a bit too cool but we did ride the Aquaduck a couple of times and love that. We watched pieces of a few movies on deck on the big screen and that is so very relaxing. With our nine year old not feeling 100 percent, she and my wife visited the medical center no fewer than five times. The team there was amazing, especially Anne the nurse from South Africa. They did everything in their power to get our little girl better fast so that she could really enjoy as much of the sailing as possible. And whether you are 2 or 92, there’s just something about seeing Donald Duck hanging out at the pool or Mickey Mouse in the atrium lobby. It just makes you feel good. All of this and so much more is why we will continue to return to Disney Cruise Line. I can’t imagine that we would have enjoyed ANY vacation, cruise or otherwise, with the sickness issues we had – as much as we did this one. Looking forward to our next sailing already!